Developmental psychopathology perspectives have emphasized that psychiatric disorders develop over time and that psychological functioning is dynamic. However, the processes examined in developmental psychopathology often fail to delineate neural system that underpin psychiatric symptoms and psychological functioning. Cognitive neuroscience models of mental illness offer insight into neural systems implicated in mental illness, but too often fail to account for change over time and developmental change. Integrating developmental psychopathology and cognitive neuroscience approaches has the potential to overcome both of these limitations and will improve understanding psychiatric disorders. 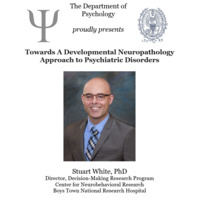 The potential of a Developmental Neuropathology Approach to psychiatric disorders will be illustrated using findings from the presenter’s research on disruptive behavior disorders. Moreover, critically needed avenues of future research will be highlighted.